When I first heard of organization consultant Marie Kondo, I was skeptical. My brother-in-law had been watching her show, Tidying Up with Marie Kondo, on Netflix earlier and was now trying to get me to watch it. I gave in and at the end of the first episode joked, “I should Marie Kondo my dorm room.” Over the next few days, I noticed that more and more people I followed on social media were Marie Kondo-ing their homes with the Konmari method. 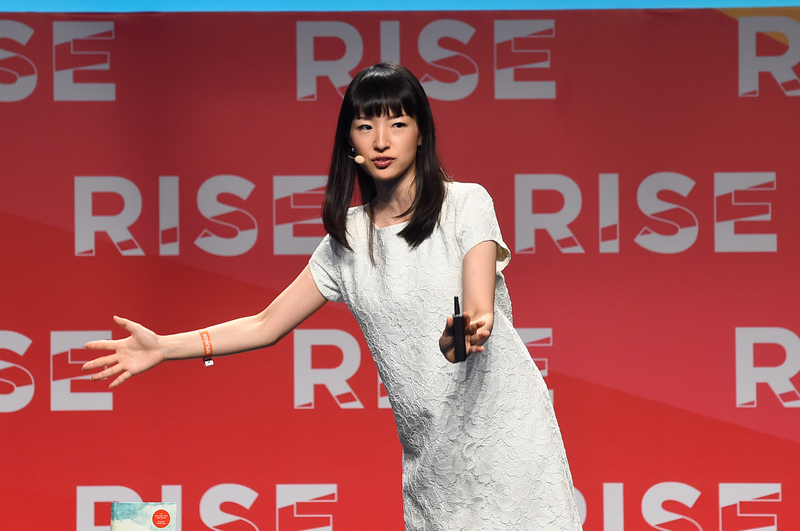 Kondo started her tidying up consultant business at 19-years-old while at Tokyo Woman’s Christian University in Japan. In 2014, her No. 1 New York Times bestseller The Life-Changing Magic of Tidying Up: The Japanese Art of Decluttering and Organizing was released and became the inspiration for her Netflix show that aired earlier this month. Her catchphrase, or how she suggests people decide what to keep is, “take each item in one’s hand and ask: ‘does this spark joy?’ If it does, keep it. If not, dispose of it.” She also says you should thank each item as you get rid of it as it makes it easier to part with. While unpacking from Christmas break, I noticed my drawers would not shut, my shirts took up more space than I had and there was lots of “stuff” around my room. I now thought, “let’s give this a try.” Fortunately, there are Kondo videos all over the internet breaking down each of her five steps and how to fold. Kondo always has the people on her show start with their clothes. They take every piece of clothing they have and pile it up on the bed. I decided to go by item to save space to walk. I piled all my shirts on my open suitcase and was amazed at how many shirts alone I have. I guessed somewhere around 150-175, with sweatshirts. I felt embarrassed by how many shirts I have. When I started going through all of them, I quickly observed how many shirts I never wore. I kept ones that brought me joy, ones I need for certain occasions and ones I wear often. The rest I folded and put in a box, to donate, while thanking each one. I felt stupid thanking a shirt at first, but at the end, I felt thankful for all the things I have. I did put some sentimental shirts in a box to send home because I couldn’t bear parting with them. By the end, I was left with 90-100. I rolled them up tightly, the way she recommends for packing, because my shirts go in hanging compartments in my wardrobe. Normally she recommends folding them similar to the way shirts are folded at a store and standing them in a drawer. I moved on to my pants next. My drawers were already open, as they could not shut with the amount I had in there. I had seven pairs of blue jeans alone. While going through my pants I kept thinking, “why do I have these many pairs of jeans?” or “I own a pair of leggings like this?” At the end of the sorting process, my drawers were able to close and each piece was folded how she described. In half, and then in thirds so it stands up. The rest of my clothes I separated quickly and then folded each the way Kondo had said to fold the article of clothes in her videos. My drawers looked so pretty at the end and I could easily locate specific pieces. The second category is cleaning books. Kondo suggests keeping book collections small and get rid of books you may not finish. I ignored her advice on that. As a college student, you never know when a book will come in handy and my inner-nerd would not let me part with any of them. The third category is papers. I had big two bins full of notebooks and old textbooks that I wanted to keep. After going through and getting rid of all old and unnecessary papers, I organized the notebooks and books into one and a half bins. In the big bin I put previous textbooks I wanted to keep and extra notebooks, and in the small bin I put the books and notebooks I am using now. For the miscellaneous category, I went through all my bathroom and kitchen things. Anything that was expired, or I didn’t need or use was put into a box to donate. I had four different types of each shampoo and conditioner and narrowed it down to two each. The last thing was going through my sentimental items. I had several boxes of pictures, momentos and random things that had been forgotten about. After looking in them, I threw away many random items that were of no importance and left the pictures and mementos, like my wand from Harry Potter World, in the box. Standing after in my room, I felt lighter. I’m sure there is still stuff to get rid of or send home but for now, I made a good start. I was always annoyed by the amount of stuff I had- and still am- but I feel better. I feel freer and lighter. At the end of the semester, I will go through everything again. It’s challenging to live in a dorm room, especially a plane ride away where you cannot go home whenever you need something. You have to keep everything you want or may need with you, and it can weigh you down. I found that using Kondo’s methods worked. It made me question “What I really need?” and “What really makes me happy?” In the end, I am glad I took the time to tidy up and I recommend doing this to your dorm room or bedroom for a fresh start feeling. Cassie Guades can be reached at cassie.guades@spartans.ut.edu.